While this epic album/book combo borrows from all eras of the band's long history, it's got its own tense seething, its own structure, its own curiosities and, finally, its own impact. Reunions and comebacks are strange things. They can feel like cashgrabs, like new bursts of inspiration, like flat repetitions of what came before. Hearing the first album in ten years from Throwing Muses, a listener might be inclined to try and peg Purgatory/Paradise with one of those too-easy labels, especially because it feels like it's been way longer than a decade since Kristin Hersh and company gave us new tunes. And it should feel like a return, a reunion, because it also comes on the heels of 2011's two-disc Anthology. But here's the thing: it doesn't feel like a reunion. Not at all. Nor does it feel like a triumphant return, though it does feel triumphant. Leave it to the ever-challenging, ever-changing Throwing Muses to take ten years off and then hit us with this, a multimedia piece that couples a book of lyrics, prose, and photographs with the band's most unruly, wide-open record to date. It's a set that comprises 32 songs and nearly 70 minutes. Some moments are shards, cutting quick and slipping away, others are fully formed musical moments, full of the band's signature buzzing and shadowy layers. For her part, Hersh's voice has aged beautifully, growing into its scuffed edges, coming across as equal parts brash and vulnerable. Behind her Dave Narcizo and Bernard Gorges make a rattling yet study foundation for her jangling guitars, angular hooks, and that voice. There's enough distance here you almost forget about Tanya Donelly, about University or The Real Ramona, or any other part of the band's earlier triumphant permutations. Almost. Except Throwing Muses retains the best parts of their identity here by twisting them into something fresh and expansive. The project is not lacking in ambition, but if you've kept up with Hersh this shouldn't be any surprise. She's been crafting solid solo record and pushing the limits of her rock ethos with the excellent 50 Foot Wave, who -- among other great releases -- gave us one of Hersh's biggest and most energetic moments with the 26-minute song "Power + Light". 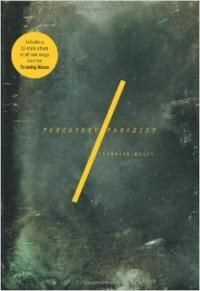 Purgatory/Paradise, though, is not about a whole, at least not in the same way. As a companion to the book, itself a strange and fascinating artifact, the songs here play like pages in a book, some torn and missing chunks perhaps, some with details and images we linger on longer, but these are brief moments that turn in to the next one quickly without looking back. But there are more wrinkles in the structure than just this "shattered" feel (as Hersh calls it in the book). Some songs work together -- like, say "sleepwalking 1" and "sleepwalking 2" -- but they may come to us out of order and songs apart on the record. "Sleepwalking 2" comes early on the record, thrumming on acoustic guitar and echoing drums and Hersh insisting that "it is too sharp here", before being interrupted by a tightrope guitar line. "Sleepwalking 1", though, comes near the end of the record, and builds on a bed of distorted guitars. It's a booming shadow that seems to come in front of the smaller figure of "2". Similarly, "Folding Fire 1" is a soft, gauzy tune, a seemingly whole part here, with deep overcast textures, but eight songs before it we got "Folding Fire 2", it's brief and fragile, flute-lead coda. To present to us a chronology and then whip it up into out-of-order hunks is disorienting, but in a charming way. It keeps us walking off-kilter, everything here tilted just so on its axis, and then we get plowed into by, say, "Sunray Venus", a brilliant industrial strength rocker, where Hersh sings about how "no one remembers your name" and you, oddly, commit the moment to memory. There's also the eye-swimming sway of "Opiates", another complete moment that drifts perfectly between here-and-now tension and lost-in-your-mind space. "Slippershell", the longest and best song here, shows the band at its most muscled. Hersh's voice smolders while Narcizo and Georges seem to gouge into the floorboards with their hard thump, each gap in their rhythm hitting as hard as a snare or kick drum, rumbling as low as any note could go. Meanwhile the guitars seem to multiple and tangle here, shifting the acoustic strum that seems to shake behind every track here into some protean beast of guitar riffs, each one snarling at the next. If these are the moments that stick, they also feel overwhelming by all the other moments around them. Sure, you're likely to remember a chorus, get a hook stuck in your ear, but really Throwing Muses seems to be suggesting that this is beside the point, that going along or even keeping up with the record and where it's going isn't as important as being locked in to any given moment. It's not that the band is stuck between the Purgatory and Paradise of the title, but more that they are playing with any and all space in between. So while song to song the album sometimes seems to drift by, almost ineffectually, as you get to the record's end, you realize the cumulative effect, that these smaller bits have made some pointillistic whole, even if what that whole is remains murky, smudged, just beyond clarity. What is clear is that this record, and book, which call into question what records and books and can and should do, how they can and should interact, still delivers in a basic, thrilling way. Throwing Muses is back or it never left and it doesn't matter which. Because while this borrows from all eras of the band's long history, it's got its own tense seething, it's own structure, it's own curiosities and, finally, it's own impact.